Appearing like a gray metallic forest in the distance, the Ghost Fleet of Suisun Bay, about 20 miles northeast of San Francisco, is the mothballed National Defense Reserve Fleet. First established in 1946, the fleet grew over 300 ships by 1955 and today still numbers over 70 vessels. In theory, the laid-up ships can be ready for active duty in 20 to 120 days. 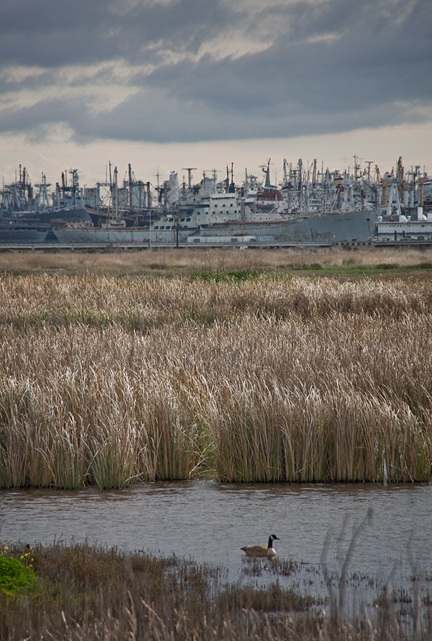 In practice, the mostly useless, rotting ships and their weapons are obsolete and present a rusting, toxic danger to Suisun Bay. For decades local environmentalists have been pressing the military to come up with a solution to the pollution coming from the ships. A 2007 study found that nearly 20 tons of toxic metals like lead, zinc and copper have flaked off the fleet's paint. In addition, the tightly tethered fleet costs $5 million a year to maintain. Unfortunately no solution or timetable has been put forward by the government for dealing with the gray giants. Most famous among the Ghost Fleet is the historic battleship, USS Iowa, known as 'The Big Stick' it was the lead ship in her battle class, earning nine battle stars during World War II and two during the Korean War. It has been proposed that the USS Iowa become a floating 900-foot museum to be harbored permanently off San Francisco's waterfront. But it is unlikely that anything will happen to the fleet for years to come.